Part of my tuition was refunded to me, so I did the most sensible thing and got a haircut. Oh, and cars. The HW pegs were updated at last, allowing me to score that CR-X, which were quite plentiful. I also saw the Mad Mike RX-7 but was sorely disappointed with the fact that the livery was on a stock build, so I passed it by. What I didn’t let go of was the Evora GTE, of which just one unit remains. And for the first time in my collecting hobby, I bought a copy of one of the cars that I already have. 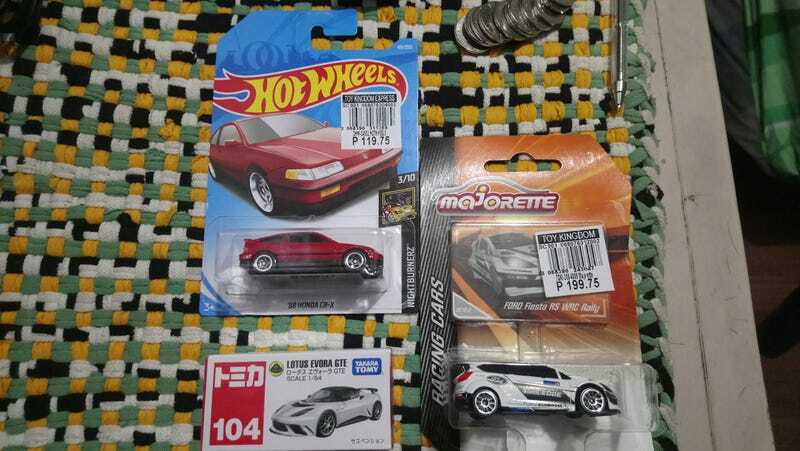 You see my old Fiesta WRC car (right) had been rotted, so when I saw a fresh stock of Majorette (it’s really fresh, like out of the catalog fresh) I took the chance. There was also the Polo R WRC but I couldn’t get past the boring factory livery. Maybe someday I can ship that old Fiesta to a guy for a new coat of paint along with other old relics.